On Wednesday, June 14, drivers on 32nd Avenue will be able to access southbound I-29 using the newly paved on ramp on the southwest side of the work zone. As this improved ramp reopens, the ramp on the northwest side of 32nd Ave. will return to one-way only traffic, only open to drivers exiting I-29. 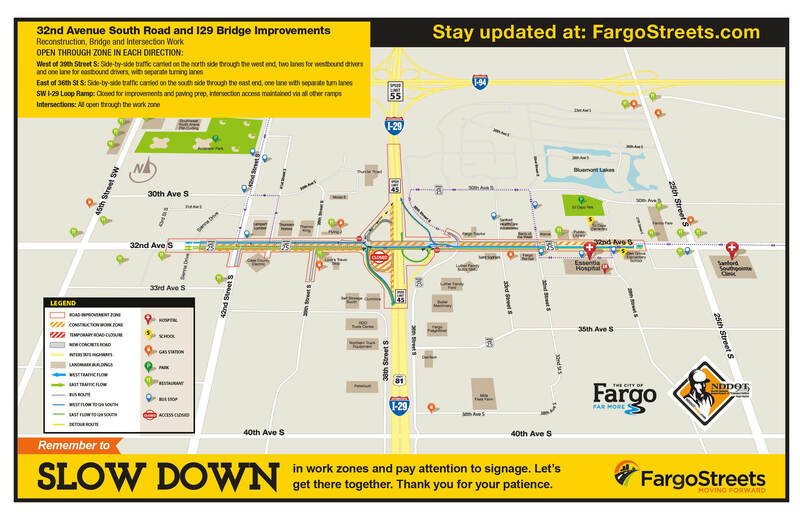 This means five of the six I-29 ramps located along 32nd Ave. will be open for traffic. See the map below for details. 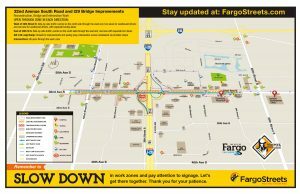 Also on Wednesday, crews will begin work on the new southwest loop ramp that requires reduced lanes on southbound I-29 for up to 10 days. During this time, the interstate will be one lane only for southbound drivers approaching the 32nd Ave. bridge. All lanes will reopen before drivers reach the I-29 on ramp on the south side of the work zone. Crews will be working near traffic, so drivers are reminded to slow down and eliminate distractions. SW I-29 Loop Ramp: Closed for improvements and paving prep, intersection access maintained via ramps on the north side of 32nd Ave.
As a reminder, the speed limit on 32nd Ave. is reduced to 25 mph and 45 mph on I-29. Please be cautious and pay attention to signage.